We are gathered here today to offer a safe space to talk about personal file organization, or the lack thereof. You've probably seen other people navigate through their Mac file structure with ease; everything is where it should be as if the Mac is an extension of their mind. For others, their file system is so messy that if their Mac truly represented their thoughts, they’d probably be in a strait jacket. However, most people probably fall somewhere in the middle. Whether you’re in the midst of an organizational emergency or you just want to be a bit more organized and efficient, we’ve got some quick and easy tips to help you achieve your goals. To start organizing your Mac, you want to look through the file structure to pinpoint folders that can be moved around and potentially merged. When your nose is buried in work or personal projects, it's very easy to drag a file to a common folder, name it, move it, forget where you put it, and some days later create the common folder name again. This can lead to folders with the same name scattered all over the place. If you find folders that you want to merge then you’re going to want to compare them for duplicate data. For instance, a “photo” folder on your system drive may have a lot of the same data as a “photo” folder on an external drive. You can compare the folders manually, but macOS (or OS X) has a way to make the comparison of two folders so much easier. You will then be presented with a list of all the differences between the two folders, providing a quick overview of what you’re up against. Note – use the names of the folders you want to compare instead of “folder-1” and “folder-2”. If, after a file compare, you see that there are files with the same name, then you’re going to want to merge folder contents. For some reason, merging folders (copying a folder to a location that has a folder with the same name) in OS X is a lot trickier than it should be. If you aren’t acutely aware of what you’re doing, it’s very easy to end up overwriting files and losing content. 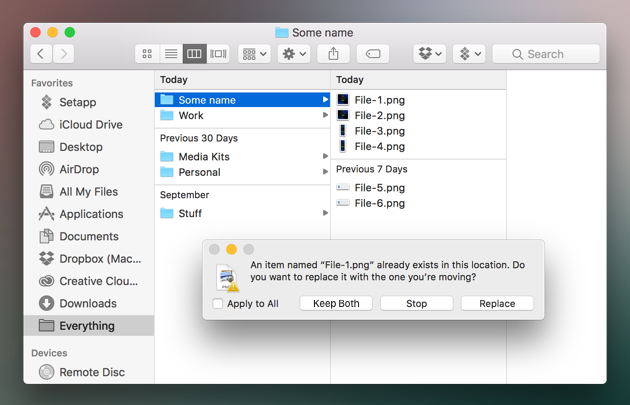 But don’t worry, we’re going to show you how to merge folders on a Mac safely. When dropping a folder into a location that has the same folder name, you will be met by a message asking if you want to replace the folder in the location or stop the process. Assuming you have different files with the same name, you’re going to want to choose “Stop” to prevent files being copied over. Drag the folder again, only this time hold down the Option key before releasing. You should now have a new option called “Merge” – click it. Now any files with the same name will automatically have a “2” added to the filename, so both the original and the new file will remain and nothing will be lost. An alternative method is to use Terminal and a command called, “ditto”. This will merge the contents of two folders, including any sub-folders within. Note - Use the actual name of the folders in place of “source_folder” and “target_folder”. 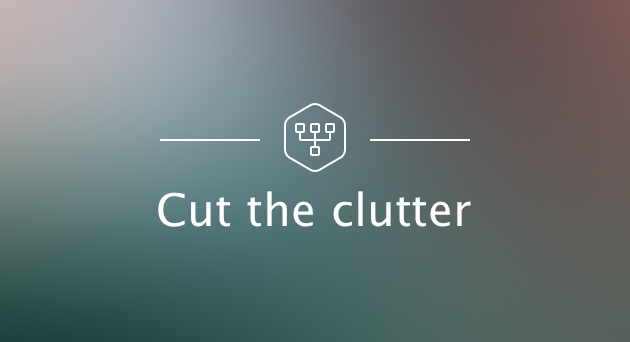 Now that your folders are merged it’s time to get rid of those annoying duplicate files. In the next section we have a tool that will remove them easily and safely. Attack of the Clones isn’t just a Star Wars movie; it is a challenge that directly relates to the problem of organizing files on a Mac. These days it is so easy to accidentally create an army of duplicate clone files, and there's no Jedi Knight to save you. You're going to have to fix up this mess yourself. Don't feel bad, we all do it. We backup a folder to a different storage device; we upload files to cloud storage, and we have use apps that duplicate files on their own, either by design or mistake. These factors are not just huge contributors to a disorganized Mac, they can also waste a lot of HDD space. Let’s look at the biggest victim of duplicate files – photos. It’s not uncommon for a Mac user to have the same photo in 3 or 4 different folder locations. Not only that, every photographer has redundant photos which, while technically different, are effectively the same photo (what is called a “similar” file) with a small change that is impossible to notice. To clear up all those duplicate and similar photos with a manual file comparison will take hours if not days. If you don’t have the patience and time, then there’s an app called Gemini 2 that will compare all your files in minutes and present the duplicates on screen for you to keep or remove. Gemini 2 has a smart algorithm that will also tackle the problem of similar photos, allowing you to clear up a lot of space that you would probably never get around to doing yourself. If you make a mistake, fear not, there is even a function for reversing the removal of duplicates, making sure that you never lose files that you want to keep. 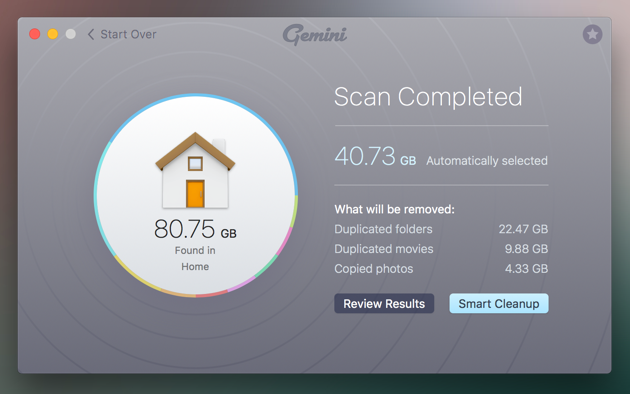 You can download Gemini 2 for free to find duplicates and similar files on your Mac and storage devices. If there is one thing to take away from this article, it’s to realize that people with organized Mac’s are not special. Thanks to macOS and Gemini 2, anyone can quickly and easily organize their Mac files and their digital lives.